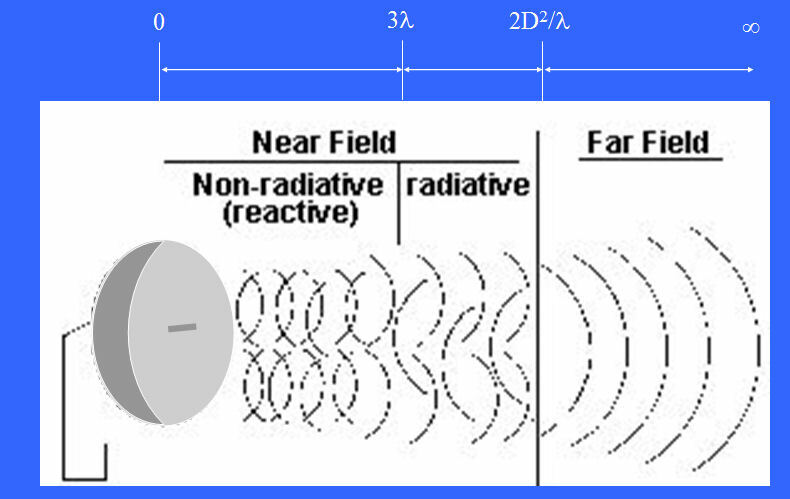 The radiation from an antenna transits through three regions as shown in the diagram below. The transitions between these regions are not distinct and changes between them are gradual. The reactive near-field region is the region close to the antenna and up to about 1 wavelength away from any radiating surface. In the reactive region, the energy decays very rapidly with distance. In the radiating near-field region, the average energy density remains fairly constant at different distances from the antenna, although there are localized energy fluctuations. The radiating near-field region extends from the reactive region boundary out to a distance defined as, 2D^2/Lambda with D being the largest dimension of the antenna aperture, and Lambda being the wavelength. For instance, for a 1m diameter antenna (~3 feet) operating at 10 GHz (λ = 3cm), the near field region extends as far as 2/.03 = 66m, or roughly 200 feet. Beyond this distance is the far-field region where the angular distribution of the energy does not vary with distance, and the power level decays according to the inverse square law with distance. 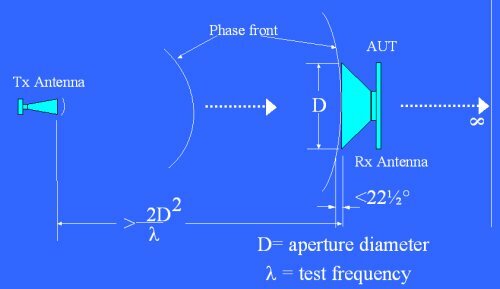 It is usually easier to measure antenna radiation pattern in the far field because the field is more uniform, and the measurement system has no effect on the antenna itself. More importantly, most antennas are intended to be used for distance communication, so the far field is what we are interested in (example of antenna intended to be used in the near field: most RF tag scanner antennas). However, as we have just seen, it is not always practical with high gain antennas. Any equipment installed in the reactive near field may affect antenna VSWR and radiation pattern because some of the energy reflected off the Antenna Under Test will bounce on the test equipment and back to the AUT. For most budget-limited applications, far-field antenna measurements are the preferred technique for determining the amplitude characteristics (gain, sidelobes) of an antenna. Particularly, low gain antennas operating below 1 GHz, and where only partial amplitude radiation characteristics are required, are candidates for far-field measurements. On a traditional far-field antenna range the transmit and receive antennas are typically separated by enough distance to simulate the intended operating environment. The Antenna Under Test is illuminated by a source antenna at a distance far enough to create a near-planar phase front over the electrical aperture of the AUT. The criteria commonly used in determining the minimum separation distance is to ensure that the phase taper is <22.5 deg as measured from the center to edge of the AUT.